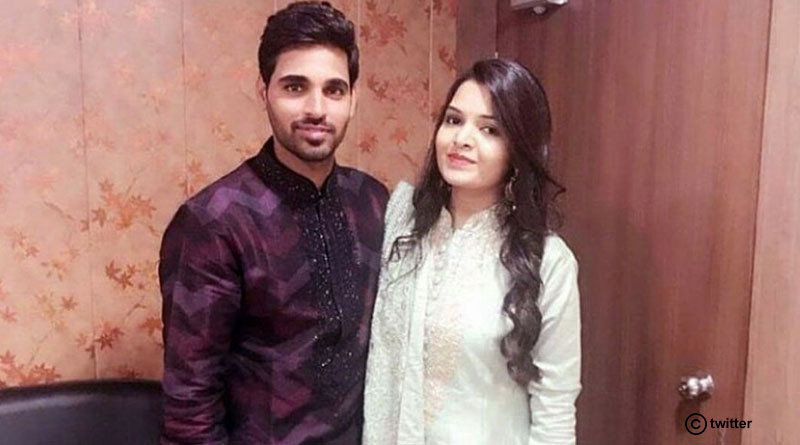 India pacer Bhuvneshwar Kumar is set to become the latest player of the team to get married as he ties the knot with Nupur Nagar tomorrow. Opener Shikhar Dhawan and Kumar have been released from the Indian squad for the remaining two test matches against Sri Lanka owing to the festivities. Dhawan who is a close friend of Kumar has already started pulling his leg before the big event. Posting a video on twitter he feels that the bowler has already become a ‘Joru ka Ghulam’ (someone who does things as per the whims and fancies of his wife). But Bhuvi defended himself and said that it was more about love and not the other way round during a hilarious exchange at the airport as the two were released from the team ahead of the second Test. Murali Vijay is expected to be drafted in place of Dhawan and Tamil Nadu all-rounder Vijay Shankar received his maiden call-up and is expected to take Kumar’s place. Dhawan posed a tough question for his teammate whether he would turn into a ‘Joru ka’, to which Bhuvneshwar replied saying, “that is called love”. “Lo ji humara ek sher kal joru ka gullam ban jaega. Isse puchte hai ki motichoor ka ladoo jo khae vo pachtae ya jo na khae vo pachtae (Here we go, one more lion from our team will be married now. Let’s ask him whether the fruits of marriage are sweet or bitter…)?”Dhawan was seen saying on twitter.